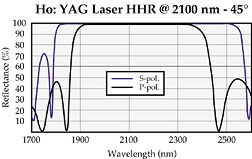 Single wavelength, high power HR for cavities and beam delivery optics. Single wavelength, high power HR coatings are suitable for intra and extra cavity use. 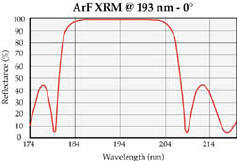 They provide the ultimate high reflectance of Rs > 99.8% and Rp > 99% for a specific wavelength. They may be used as a rear cavity reflector or for extra cavity use in beam delivery or turning. Note that Lambda high quality visible laser cavity coatings are designed for low scattering. Broadband HR coatings provide an average reflectance of 99% over a broad range of wavelengths. These broadband mirrors may be used for white light or multi-spectral applications.